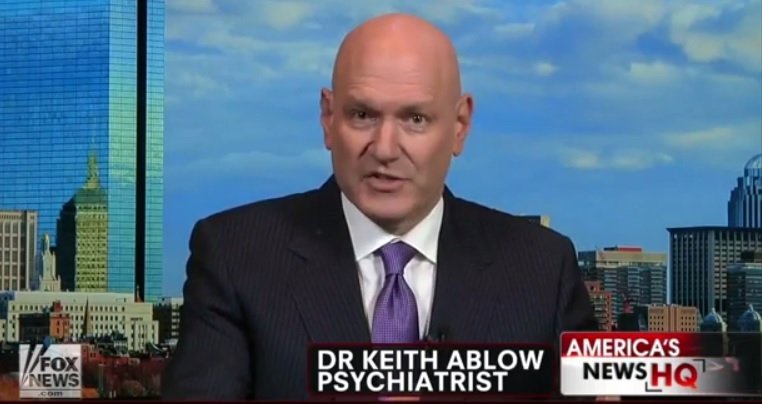 Fox News "Medical A Team" member Dr. Keith Ablow continued his pattern of baseless smears against LGBT people with an ill-informed, transphobic rant against a new California law that allows transgender students to use facilities that match their gender identities. I don't see anything but toxicity from the notion of a person with female anatomy feeling free to use the urinal in the boys' rest room while a boy stands next to her and uses one, too. And shaking the certain knowledge in boys and girls of whether they can count on not being seen naked by the opposite gender, not to mention whether they are themselves actually the gender they thought they were, is a powerful, devious and pathological way to weaken them by making them question their sense of safety, security and certainty about anything and everything. Ablow's worst fears are baseless. School districts that have implemented similar policies have reported "nothing but positive results" and no instances of misconduct, which is why anti-LGBT groups have been forced to make up incidents of their own. I don't believe we have definitive data (although many psychiatrists with very impressive credentials, who seem to mean well, assert that we do) that any male or female soul has ever in the history of the world been born into the wrong anatomic gender. Those well-meaning psychiatrists include the American Psychiatric Association and the American Psychological Association, which both recognize transgender people as real and deserving of respect and acknowledgment. Instead of taking the advice of America's largest professional psychological and psychiatric organizations, Ablow - who has no expertise in gender or sexuality issues - merely asserted that he is "not convinced" of the existence of transgender people. Of course, Ablow has a history of commenting on issues that he's completely unqualified to discuss. A repeated misinformer on LGBT people, Ablow is one of the most prominent faces of Fox's transphobia problem. He's one of the network's most vocal defenders of junk "ex-gay" therapy programs and lashes out against the American Psychological Association for being politically motivated whenever its stances don't comport with his bigoted views. Most recently, Ablow garnered attention for declaring that "marriage died in 2013" because of gay people and polygamists. To any reality-based observer, Ablow's hyperbole and pseudoscience discredit him as a commentator on LGBT issues, but Fox News doesn't seem to mind.